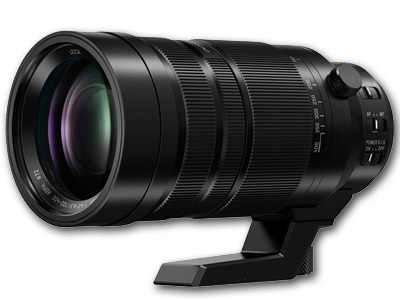 Micro Four Thirds lens with a not-so-micro zoom range, the Leica DG Vario-Elmar 100-400mm f/4-6.3 ASPH. POWER O.I.S. Lens from Panasonic offers a truly expansive 200-800mm equivalent focal length range, yet retains a relatively compact stature to suit the Micro Four Thirds system. Characterized by its Leica branding, this sophisticated optic employs aspherical and extra-low dispersion elements to significantly reduce chromatic and spherical aberrations throughout the zoom range for a high degree of image clarity and sharpness. Also benefiting image sharpness, a POWER O.I.S. system, which is compatible with Lumix G camera's Dual I.S. function, helps to minimize the appearance of camera shake for sharper handheld shooting at longer focal lengths. Benefiting both stills shooting and video recording, a 240 fps high-speed AF motor is both quiet and precise, and a focus limiter function can be employed to constrain the focusing range for even quicker performance. Additionally, the physical design of the lens utilizes a gapless construction that renders it both dust- and moisture-resistant for use in inclement conditions. And while its lightweight, compact form factor is suitable for handheld shooting, the 100-400mm f/4-6.3 also features an integrated rotating tripod collar for fast switching between horizontal and vertical shooting orientations when working atop a monopod or tripod. Dispersion element, and two extra-low dispersion elements. The combination of aspherical and low dispersion elements helps to reduce spherical aberrations and colour fringing throughout the zoom range for improved sharpness, clarity, and colour accuracy.